For about 23 years, Rob Harting and Robin Gent (both enthusiastic golfers) have brought holidaymakers to Malaysia, making sure they have enjoyable, unforgettable and hassle-free holidays here. All under the name of Distant Greens Golfing Holidays. 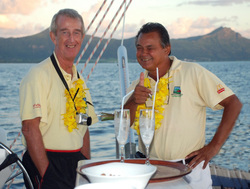 Since 2000, Robin has lived permanently on Langkawi and, for the past 13 years, Rob has spent his winters on this exotic, paradise island. They both speak fluent English and Dutch, and have a working knowledge of several other languages. They are also fully familiar with Malaysia and Langkawi, the people, their customs and their way of life. And there is almost always one (or both) of them on hand to help deal with special requests or problems that may arise. If you need advice on what to do, where to go, places to see, the best restaurants, the best deals etc., all you have to is ask. They can also advise what not to do! In a country with a different cultures, this can help to prevent embarrassments and ensure you enjoy your holiday in Langkawi to the full. Has more than 25 years experience with Malaysia as holiday destination. During this time, he has learned a great deal about this beautiful country. Especially where golfing is concerned. This fluent Dutch-speaking Englishman also has extensive experience in Marketing and Business Management. A former top-ten squash player in the Netherlands, Rob later became manager of the Dutch Squash Bond and took teams to the European and World Championships. This gave him invaluable experience in organising accompanying group holidays. A single-handicap golfer Rob counts good communication skills among his qualities.